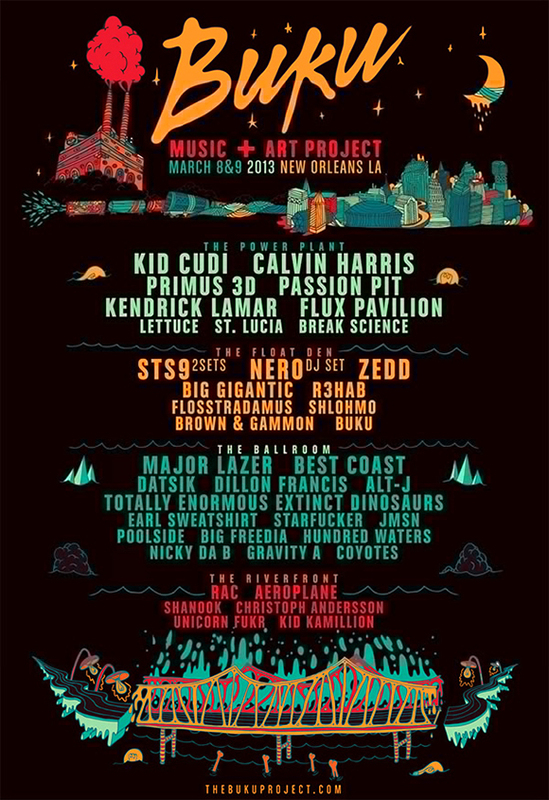 As if there weren’t enough reasons to visit New Orleans over spring break, the Buku Project just released the lineup for its 2 day festival in March of next year. With heavy hitting electronic acts like Zedd, Zeds Dead, Kaskade, Skream, Baauer, RL Grime and Chromeo, it promises quite the good time. What makes the festival so interesting is the addition of many great non-EDM acts including Explosions in the Sky, The Flaming Lips, Wavves, Schoolboy Q and Tyler, The Creator, Trinidad Jame$, Kid Cudi, Kendrick Lamar, Alt J….the list goes on for ever. Tickets are on sale for only $169.50 so get them now while supplies last if you plan on attending the Buku Project next year. I really writing a lot.